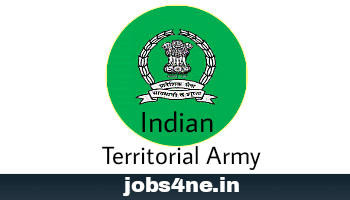 Indian Territorial Army Recruitment 2017- Territorial Army Officers (Non Departmental) Vacancies. - Jobs4NE : Jobs in Assam and North East India. Indian Territorial Army Recruitment 2017- Territorial Army Officers (Non Departmental) Vacancies. Applications are invited from gainfully employed young men for an opportunity of donning the uniform and serving the nation as Territorial Army Officers (Non Departmental), based on the concept of enabling motivated young men to serve in a military environment without having to sacrifice their primary professions. You can serve the nation in two capacities- as a civilian and as a soldier. No other option allows you such an expanse of experiences. Starting date of online application: 01-06-2017. Last date of online application: 30-06-2017. Name of the post: Territorial Army Officers (Non Departmental). LIEUTENANT: PB-3/15600-39100/- + GP Rs. 5400/- + MSP Rs. 6000/-. CAPTAIN: PB-3/15600-39100/- + GP Rs. 6100/- + MSP Rs. 6000/-. MAJOR: PB-3/15600-39100/- + GP Rs. 6600/- + MSP Rs. 6000/-. LT COLONEL: PB-4/37400-67000/- + GP Rs. 8000/- + MSP Rs. 6000/-. COLONEL: PB-4/37400-67000/- + GP Rs. 8700/- + MSP Rs. 6000/-. BRIGADIER: PB-4/37400-67000/- + GP Rs. 8900/- + MSP Rs. 6000/-. Centres of Examination: CHANDIGARH, LUCKNOW, PATNA, KOLKATA, SHILLONG, JAIPUR, PUNE, BANGALURU, HYDERABAD, UDHAMPUR, SRINAGAR. Application Fee: Candidates’ are required to pay a fee of Rs 200/- (Rupees two hundred only). Candidates should note that payment of examination fee can be made only through the modes prescribed at website. Payment of fee through any other mode is neither valid nor acceptable. Applications submitted without the prescribed fee/ mode shall be summarily rejected. Fee once paid shall not be refunded under any circumstances nor can the fee be held in reserve for any other examination or selection.